When you are on holiday and exploring the best things that Italy has to offer (like food and art), it may sound like the world’s most counterproductive idea to put time aside to visit the local universities, too. This may well be the case, but and nevertheless let me introduce you to three universities in Italy the long history and the association with the arts and the sciences of which may easily make you regret that you didn’t, in fact, study at them. Who knows?! By the end of your visit as a tourist to one or all of them you may even reconsider your plans for mature education after all. For the Universities of Bologna, Padua and Venice are not just some of the most reputable higher education establishments in the world. In the case of those of Bologna and Padua, they are also the world’s first and fifth oldest Universities still in continuous operation! Plus, all three of the Universities in Italy I want to introduce you to are housed in some of the most stunning buildings you will have the chance to see in Italy. And visiting them will put you in direct touch with the scientific, philosophical and artistic history of a country which laid the ground for the Western world as we see it today. After all, walking in the steps of Galileo, Petrarch and Copernicus, to mention but a three of the notable alumni and professors of these three Universities, is definitely something to put high on your travel wish list. With its 930 years of history and still going strong today, the University of Bologna is, undoubtedly, the oldest surviving University in the world. Founded in 1088, nowadays it has grown to 85 000 students and campuses not only in Bologna, but also in four other Italian cities (Ravenna, Forli, Cesena and Rimini) and in Buenos Aires, the capital of Argentina. It is not in vain that they call Bologna La Dotta (The Learned One) on account of its long academic history. After all, among the University of Bologna’s most notable alumni stand such illustrious names as: the poet and scholar Petrarch, the mathematician and astronomer Nicolaus Copernicus, the inventor Guglielmo Marconi,the screenwriter Michelangelo Antonioni, the fashion designer Giorgio Armani, as well as several popes. 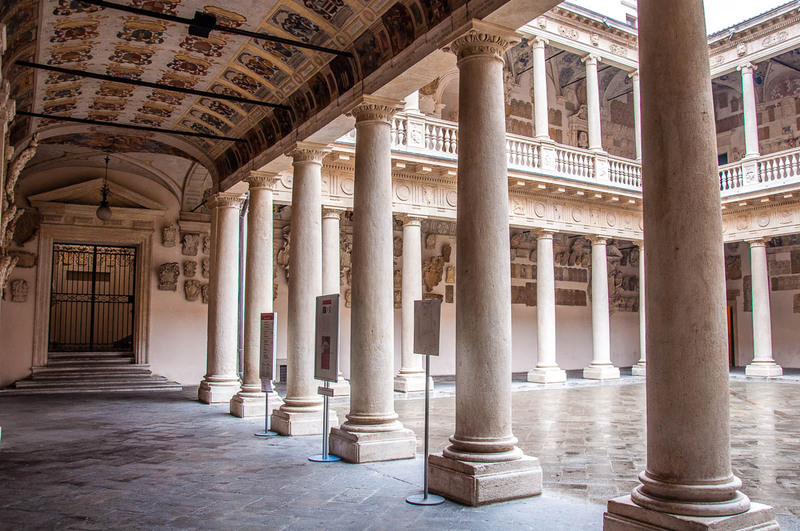 In order to feel and see for yourself the legacy of the University of Bologna, without actually being a student there, you need to visit the University’s first permanent seat. Called Archiginnasio, it was built between 1562 and 1563 on the orders of Pope Pius IV to house all of the University’s different schools which until that moment had been dispersed all over the city. The Archiginnasio remained a place of study until 1803 at which point the University was moved to Palazzo Poggi. 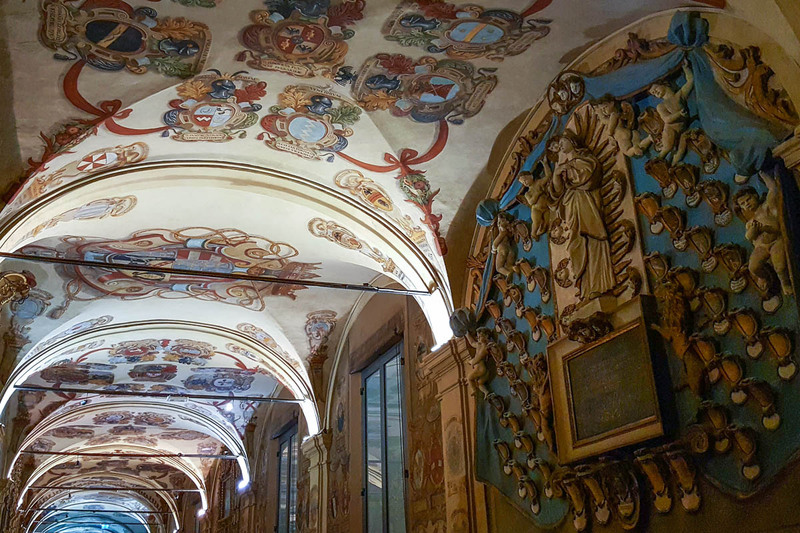 You will find the Archiginnasio at Piazza Galvani in the heart of the city, just a few moments away from Bologna’s central Piazza Maggiore. Put at least an hour/hour and a half aside to take it all in. The Archiginnasio is very beautiful. Its porch is 139 metres long with 30 arches supported by carved sandstone columns. The courtyard, surrounded by frescoed loggias, is stunning. It used to be the centre of academic life and the place where a special ceremony would be held for the preparation of the Teriaca (or Triaca) – a cure-all universal remedy made of fifty ingredients which was particularly efficient in the treatment of venomous bites. Two richly frescoed staircases lead to the upper floor where you can admire students’ coats of arms (around six thousand of them! ), inscriptions and monuments in honour of prominent professors in the fields of science and arts, as well as temporary exhibitions. Spend some time exploring the huge heraldic collection. Each coat of arms mentions the name of the student, his place of origin and his home country. 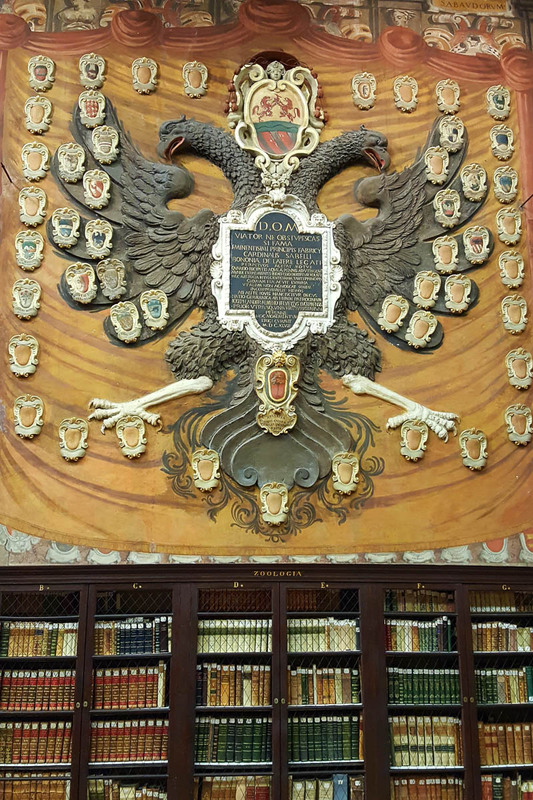 Only the students who were heads of the student organisations could have their coat of arms placed on the walls of the Archiginnasio. 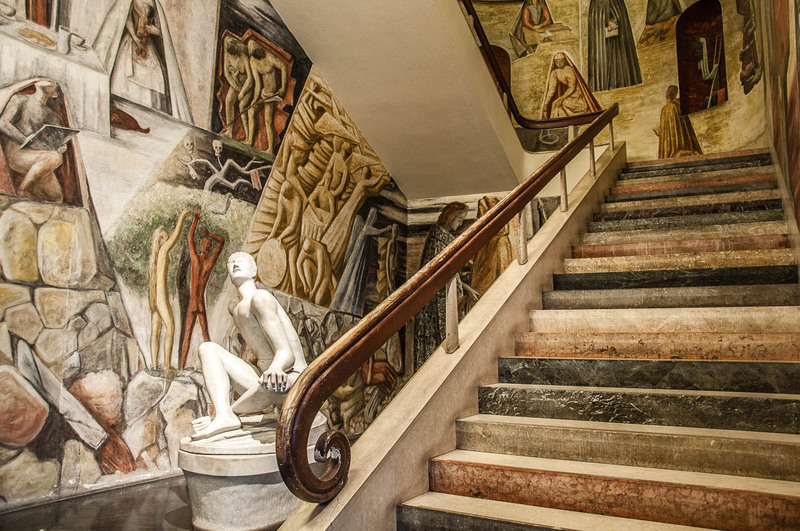 The left grand staircase leads to what once were the Faculty of the ‘Artisti’ – students of medicine, philosophy and science. The right grand staircase leads to what once were the Faculty of the ‘Legisti’ – students of law. There are ten classrooms on the upper hall. Originally, five of them were used by the Legisti and the other five by the Artisti. Nowadays, these classrooms cannot be visited as they contain the book deposits of Bologna’s Civic Library which has been housed in the Archiginnasio since 1838. 1. Anatomical Theatre – built in 1637 by Antonio Paolucci (also known as Levanti), this amphitheatrical hall was used to teach anatomy through the dissection of corpses. The hall is fully covered with panels made of spruce wood and is decorated with statues of famous ancient and Bolognese physicians and anatomists. In the middle of the paneled ceiling (dating back to 1645) there is a figure of the god of medicine Apollo surrounded by 14 constellations. A special mention deserve the two skinless statues showing the complexity of the human body. These statues are called Spelati (skinned men) and since 1734 they have been flanking the teacher’s desk which is right above the desk of the demonstrator. A female statue representing Anatomy sits on the canopy above the teacher’s desk. A small statue of an angel offers her a thighbone. The Anatomical Theatre was badly damaged during the bombing of Bologna on 29th January 1944. It has been meticulously recreated using as much as possible the original parts and statues salvaged from the ruins. On the door leading into the Anatomical Theatre there is a very interesting informational board talking about the bombing and the restoration process. 2. Stamat Mater Hall (formerly used as a home lecture hall by the Legisti) – nowadays this stunning room is used to host major cultural events and exhibitions. This is where on 18th March 1842 the Stabat Mater of Rossini was performed for the first time with Gaetano Donizetti as the conductor. The hall is lavishly decorated with coats of arms, plasters and frescoes. The thing which impressed me the most here were the thematically organised bookshelves lining up the walls. We asked if the books were originals and were told: ‘All the books here are only from the 14th-15th centuries onwards. Anything older than that is kept in our book depositories.’ We were suitably impressed! Click here to watch a short video of the Stabat Mater Hall which I posted on my blog’s page in Facebook. N.B. : There is a small fee of 3 euros in order to visit the Anatomical Theatre and the Stamat Mater Hall. It is more than worth it! 3. Reading Hall of the Library (formerly used as a home lecture hall by the Artisti) and book depositories – as these are part of a working library, they are usually off-limits for tourists, but, if you are lucky, you can catch a glimpse of the former ten classrooms which nowadays are interconnected and house an incredible number of books under lavishly frescoed walls. If you are interested in using the library services, click on the link under ‘More Information’ below. 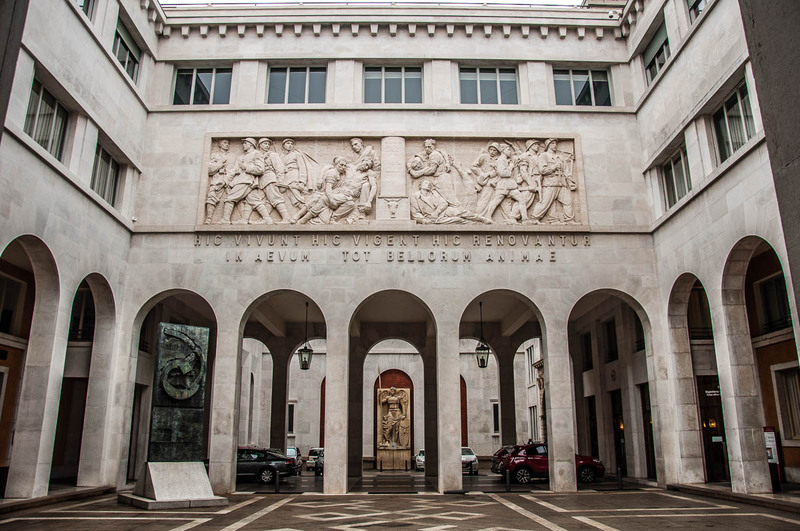 After all, this is the most important civic library in Italy and has around 850 000 volumes and booklets (including 2500 editions from the 15th century and 15 000 editions from the 16th century), 9000 manuscripts, 200 archives, 45 000 drawings, engravings and photographs, 9000 periodicals, including 700 current periodicals, and 100 CDs of general works. 4. Chapel of Santa Maria dei Bulgari – on your way out of the Archiginnasio, stop in the courtyard in order to visit this very old chapel where at the end of the 16th century Bartolomeo Cesi – a painter from Bologna – painted a cycle of frescoes dedicated to the life of the Virgin Mary. The chapel suffered greatly during the bombing which devastated the University’s Anatomical theatre. It was restored after the end of the Second World War. 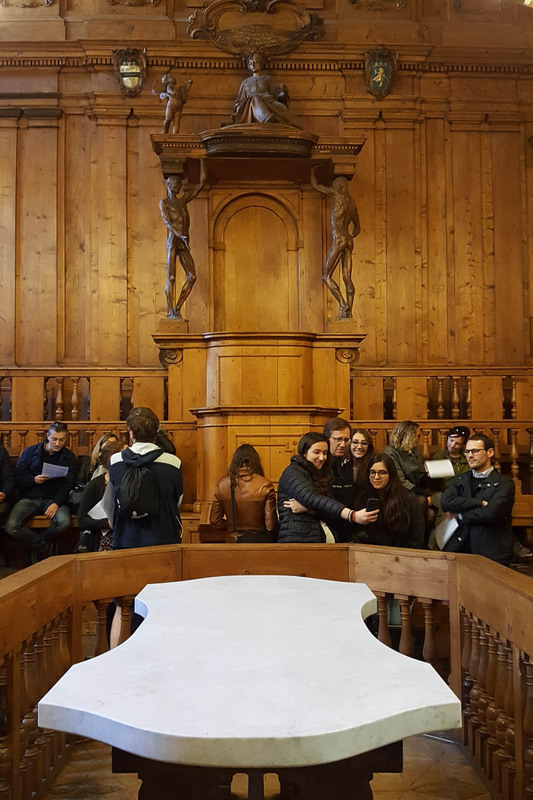 In Conclusion: Visiting the Archiginnasio – the first permanent seat of the University of Bologna – is a great and authentic way to learn more about the city of Bologna and its long academic history. It is also a fabulous chance to see where it all started in terms of University education and traditions. Also, click here to read my blog post: Bologna, Italy – 10 Stories to Introduce You to the Fat Lady of Italian Cities. Only slightly younger than its counterpart in Bologna, the University of Padua had its start in 1222 and thus is the second oldest University in Italy and the fifth still in operation today University in the world. Housed in the splendid Palazzo Bo (its historical seat since 1539), the University of Padua has grown to 62 577 students (as per data from 2015) and in 2016 it was ranked as the best university among Italian institutions of higher education with more than 40 000 students. The University has campuses and faculty all over the Northern Italian region of Veneto – from an Astro-Physics Observatory in the Asiago plateau to an Institute of Management Engineering in Vicenza. When in Padua, you will feel the city’s strong student vibe with scores of young people taking over the city centre’s cafes and bars after dark. It is especially lovely to watch them during the days of their graduation ceremonies, when students with wreaths made of real laurel leaves on their heads celebrate the achievement of their lives. You cannot miss Palazzo Bo – the University of Padua’s historical seat – even if it is your first time walking through the city. You will find it on the very central Via VIII Febbraio, just opposite Palazzo Moroni (also called Palazzo Comunale which houses the Municipality of Padua) and a stone’s throw away from the splendid Palazzo della Ragione which is surrounded by Padua’s 800-years old market. There used to be buildings as early as the 13th century at the place currently occupied by Palazzo Bo. Then an inn called ‘Bo’ – The Ox – was in operation there in the 14th century. Later, in 1405, the building was given as a gift to a butcher who supplied with meat the Lords of Padua – the Carrara family. The Palazzo was acquired by the University in 1539. 1. Anatomical Theatre – the first permanent anatomical theatre in the world. Made of wood and with, they say, intentionally uncomfortable benches, so that the students wouldn’t fall asleep, the theatre was used from 1595 to 1872. 2. Aula Magna (the Great Hall) – it started its life simply as the dining room of the inn which was originally at that place. Once Palazzo Bo was taken over by the University, this huge room became the place where the Legisti (the Jurists) studied. It was also where Galileo Galilei taught during his 18 years at the University of Padua. So popular were his lectures that no other room at Palazzo Bo would fit all the students who wanted to listen to him. 3. 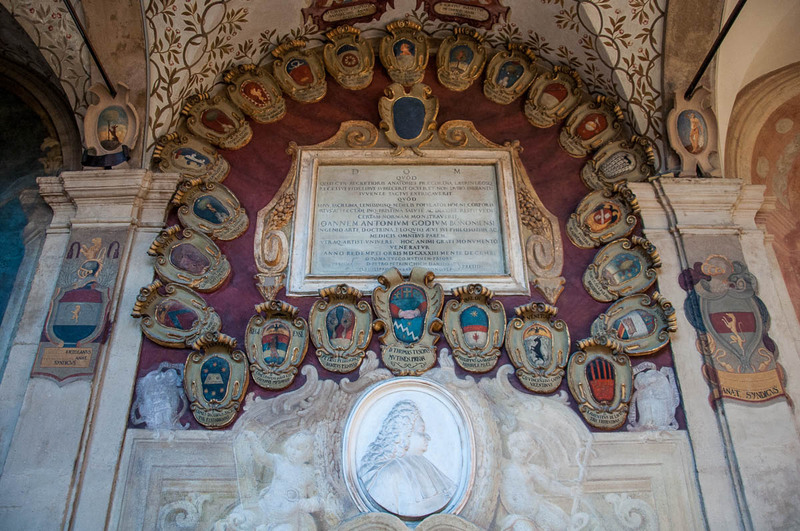 The Hall of the Forty – a room leading to Aula Magna and where forty portraits painted in 1942 (with no claims for physical likeness) represent forty illustrious foreigners who studied at the University of Padua. Among them you will recognise English, German, Armenian, Greek, Hungarian, Danish and Swedish men of academic and scientific fame. In the Hall of the Forty you can also see the podium on which Galileo would stand to teach. This was originally placed in the Aula Magna, but nowadays it is positioned in the Hall of the Forty. 4. The Room of Medicine (also known as Medicine Hall) – one of the oldest teaching rooms, covered in frescoes and dating back to the 14th century. This is where nowadays students of medicine defend in public their degree theses. Please, note, that if any events are taking place at one of the rooms from points 2 to 4 above, you may not be able to visit it as part of your guided tour. It really is best to call in advance to make sure that there is nothing scheduled on the day you want to take the tour. Another point of interest in Padua you mustn’t miss, if you are interested in the academic history of the city, is the Botanical Garden. It dates back to 1545 and it is considered to be the oldest University Botanical Garden in the world. It is a lovely place to visit especially on a hot Italian day when you can seek refuge under the deep shadows of its many trees. The University of Padua also runs nine museums in town and has a rich program of events. For example, in September 2017, the University took part in the initiative VenetoNight – part of the European Researchers Night. The different schools and faculties of the University set up booths in the courtyards of Palazzo Bo showing to the general public the advancements in their respective fields. It was a lot of fun for both adults and children and a great chance to meet the students and their professors face to face and learn about their academic work and its applications in real life. In conclusion: You cannot visit Padua and not stop at its University. It defines the city so much that you would be missing a huge opportunity to learn more about Padua, its history and its modern-day character. Another one of my blog posts: ‘Padua’s Botanical Garden and the Basilica of Santa Giustina‘. 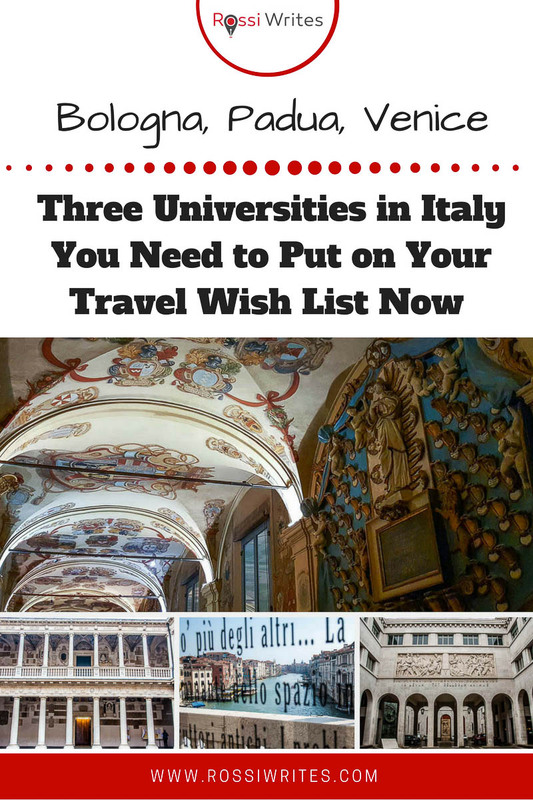 Let’s finish this list of the three Universities in Italy you need to put on your travel wish list with the baby among them all. For while the Universities of Bologna and Padua have hundreds of years of teaching and learning behind their illustrious backs, the Ca’ Foscari University of Venice was founded as a Royal High School of Commerce in 1868 and became a University as recently as 1968. Which is positively young in terms of Italy. 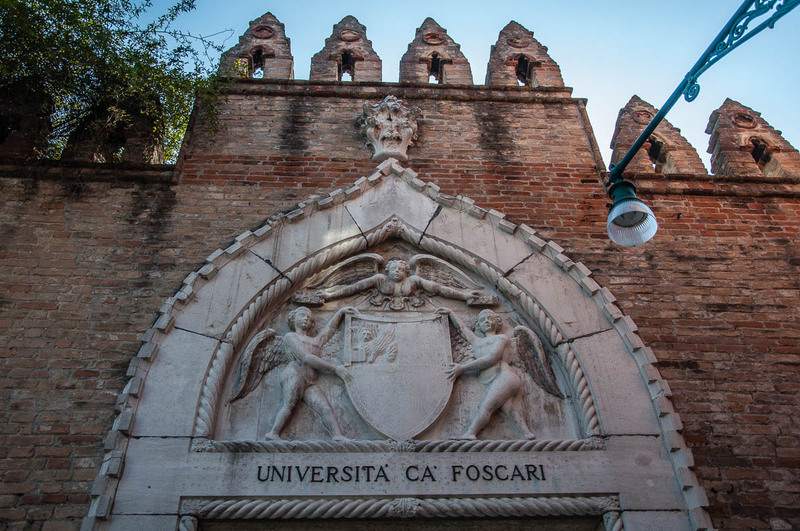 Yet, in spite of its short existence, Ca’ Foscari University has managed to achieve great things and is nowadays, among many things, one of the most renowned places to learn languages and linguistics in Italy. There are just over 19 000 students in its eight departments: Economics; Phylosophy and Cultural Heritage; Management; Environmental Science, Computer Science and Statistics; Molecular Science and Nanosystems; Linguistic and Comparative Cultural Studies; Humanities; Asian and Mediterranean African Studies. The Ca’ Foscari University of Venice is housed in a stunning Gothic palace in the sestiere of Dorsoduro just a few steps away from the Museum of 18th Century Venice Ca’ Rezzonico and the Gallerie dell’Accademia. Built in 1453 for the Doge Francesco Foscari, it is the only place on the Grand Canal from the windows of the upper floor of which you can see both the Rialto Bridge on the left and the Accademia Bridge on the right. 1. 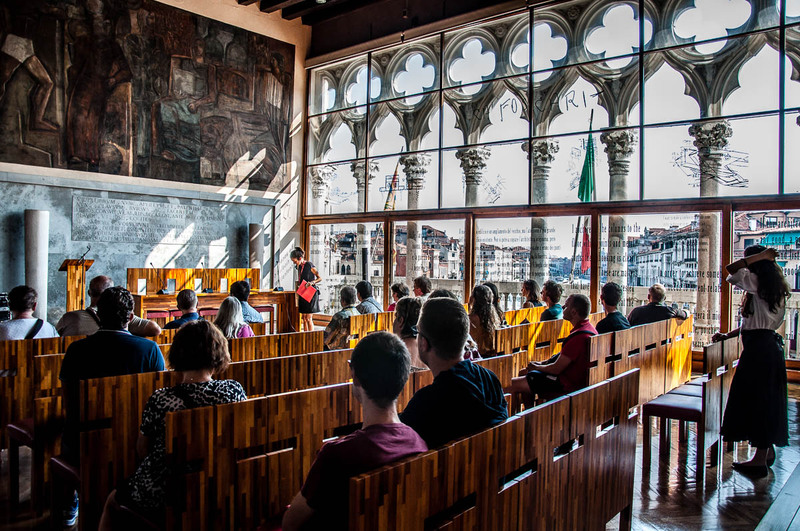 Guided tour of Ca’ Foscari – you will be taken on a tour of the Gothic palace which is the historic seat of the University. You will have a chance to see its most iconic rooms and halls with an emphasis placed on the projects executed by the Venetian architect Carlo Scarpa. 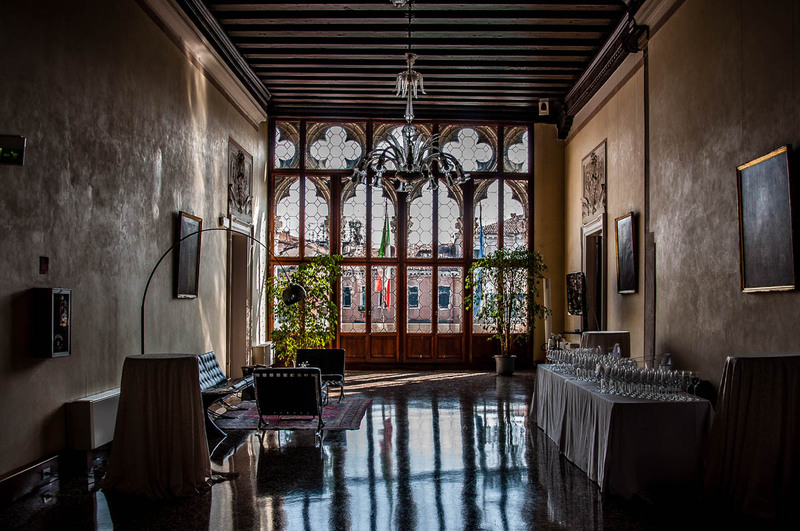 A special mention here deserves the Mario Baratto Hall (Aula Baratto) which nowadays is used for special events and which offers stunning views over the largest bend of the Grand Canal. This tour lasts an hour. 2. 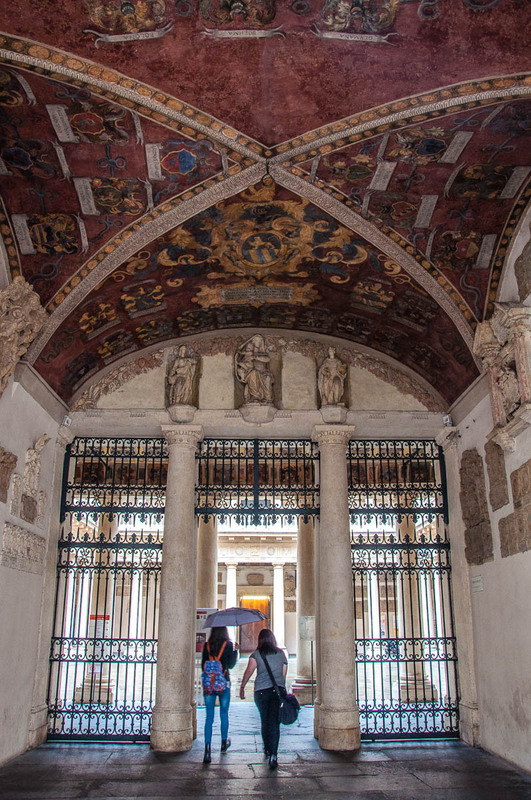 Guided tour of Ca’ Foscari and Ca’ Dolfin – in addition to touring Ca’ Foscari, you will also be taken to the nearby Ca’ Dolfin – a beautiful palazzo with frescoed ceilings where you can see the University’s Great Hall. This tour lasts 75 mins. In Conclusion: Visiting Ca’ Foscari University of Venice is a great way to see Venice from an unexpected point of view. This is an energetic place with beautiful architecture and interesting history where you can feel both the traditions and the future of the city on water. 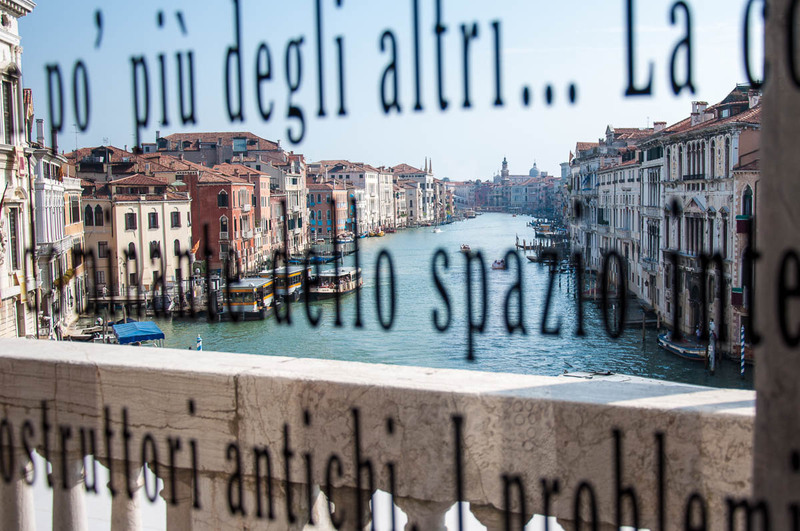 You may have never thought of Venice as an academic place, so visiting its University will help you see how much more there is to Venice than just overcrowding and tourist cliches. Read about Venice Historical Regatta and the role Ca’ Foscari University of Venice plays in it in my blog post here. I hope that I have inspired you to explore Italy from a new angle – that of its academic past and present through a visit to one of its most notable Universities. Let me know which one of the three Universities in Italy presented above you would either like to visit or have already explored. Thank you for this post. I’ve been to Venice and Padua during the interesting graduation events, seeing the students being “honored” for their graduation in the streets and campi. I never thought to actually take a tour of the universities though. I’m always looking for something new to see on another trip – thanks again!